To further explore the motivations and challenges companies face in implementing and tracking paid family and medical leave, we’re kicking off a series of interviews with pledge companies, beginning with Erin Moran, Chief Culture Officer, at Union Square Hospitality Group. In June 2018 Panorama announced The Paid Leave Pledge to further the adoption of paid leave by U.S. employers. The effort, which galvanizes leading business voices on paid leave around a commitment to share data on the impact of their paid family and medical leave (PFML) programs, aims to build the evidence base to support broad paid leave adoption. USHG has long been a leader on paid leave, even despite the especially tough environment restaurants, and those in the hospitality industry in general, face. A Pew Research study released in 2017 found workers in the leisure/hospitality sector have some of the lowest rates of access to paid family leave with only about 6% reporting the benefit. While seldom discussed, restaurant workers make up the largest single employment group in the United States. If you include hospitality workers the workforce is nearly double that of any other industry in the country. Even more, on average, restaurant workers are the third lowest paying job in the U.S. Again, according to Pew, 30% of workers with household incomes under $30,000 said that they were unable to take leave when they needed it. USHG not only recognized this, but also thought, if employers in this industry can shift their thinking it could be hugely impactful to the future of work. In 2016 the restaurant group, formed by Danny Meyer, did what they believed to be the right thing in implementing a paid leave policy that includes the same expansive maternity program for both hourly and salaried workers. It was, and still is, a big deal. Many large companies have only recently rolled out equitable benefits across their workforce. Eater NY appropriately covered the significance of Meyer’s groundbreaking move. The effort didn’t come without consequence or challenge. As with any business, cost is always a consideration. Even more so for businesses, such as restaurants, which often have high overhead and low profit margins. For Chief Culture Officer Erin Moran, it was her proudest moment at the company. Regarding measurement of impact, Moran and team recognize PFML is a long-term return. While you can budget investments and returns such as talent attraction and retention, it is difficult to predict. Panorama is thrilled to have USHG as one of the first leaders to join the paid leave pledge. Their commitment punctuates their already bold, public statement about how important paid leave is to them. We also hope it inspires others to push their thinking and join the cause. 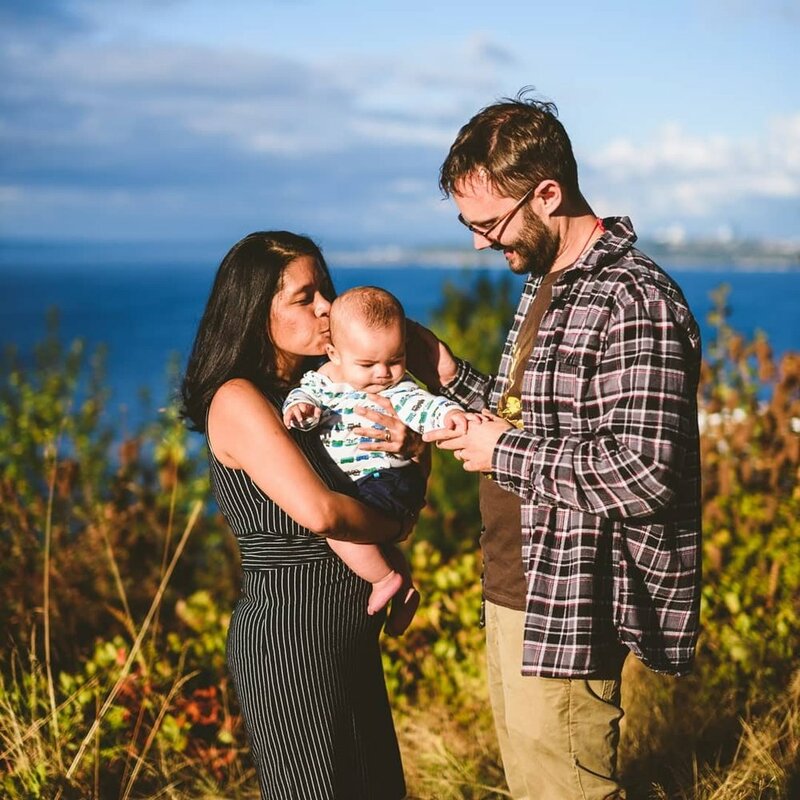 In celebration of National Parents’ Day, which is celebrated in the U.S. on Sunday, July 22, Panorama staff reflected on what access to paid leave has meant to their relationships with, or as, parents. Being able to bond with a child, or care for yourself or a loved one is a right the majority of Americans simply don’t have. Currently, only 14% of the U.S. workforce has access to paid leave, a resource common in nearly every other developed country. As we celebrate our parents, and what it means to be a parent and shape a child, we find ourselves ever more devoted to helping map a future where all Americans have access to paid leave. Happy #nationalparentsday from Panorama! Share your story with us or on social media with the hashtags #nationalparentsday and #paidleave. My father was born during the depression to tenant farmers. The lifestyle meant early mornings and late nights, hard work and questionable income. As he came into adulthood, he took the road less traveled, putting himself through college to become an actor. To describe my father as a man of tenacity might be an understatement – he took himself from a one-room schoolhouse to a master’s degree, and from a wardrobe made of old grain sacks to one created by costume designers. The similarities between his life on the farm and that on the stage may not be completely obvious, but each present a unique set of challenges not too far removed from the realities of the independent workforce we see growing today. The work is hard and inconsistent, it leaves the worker without protections or security, and there is no telling what the next move will be. By the time I was born my father was 50 and had managed to find a cadence in these ebbs and flows. It was from him that I learned about what it meant to have a work ethic. He taught me to find solutions for anything that didn’t work, the meaning of “an honest day’s work,” and how to make the most of what was in front of me. Without knowing it, that laid the foundation for a future where I would work to align business and worker priorities. A series of seemingly disconnected moments led me to a position with the Obama administration, and a period in my life that I will always hold in the highest regard. Part of my time there was served at the U.S. Department of Labor (DOL), where my fellow colleagues worked tirelessly to ensure that people, like my father, have the protections and supports necessary to be successful. Throughout my tenure at DOL, I frequently joined forces with businesses to advance worker needs, overcoming the prevalent narrative that what is good for workers is bad for business. In that role, I came to understand the value of uniting unlikely allies and had many opportunities to create moments where seemingly conflicting perspectives were able to share common ground. The experience forever shaped my own views, and I vowed to continue the work of furthering worker-centric supports into the future. As I pondered the next step in my career, I was introduced to Gabrielle Fitzgerald, CEO of Panorama. She gave me the opportunity to think about how Panorama’s work with companies on paid leave might grow to encompass the needs of a changing workforce. It was during these conversations that my father was abruptly rushed into an emergency heart surgery. His recovery was complicated, and he found himself in a rehabilitation facility. It was while sitting just a few feet from his hospital bed that I finished writing my proposal on this work – and in those moments I realized that while my passion for this work had always been clear, never had it been so poignant. Shortly after, I joined Panorama – were I have the opportunity to lay the groundwork for business-led solutions that advance the needs of a changing workforce. We believe that a dependable livelihood should be a reality for all people and that the contributions of a diverse group of people is essential to driving innovation in the coming decades. This becomes a reality when all workers have the support they need to thrive, and employers see worker-supports as essential to the cost of doing business. Regardless of where we come from, we all have to work hard to balance our jobs and the personal demands of our lives. I am inspired by the innovative ways businesses are leading the charge and look forward to working with these leaders to ensure that all American’s have the opportunity to thrive at work and at home. Thanks to my dad for showing me the way. As I head to the WorkHuman conference in Austin, I find my mind drifting to my time in the technology industry. As a Seattleite, it’s likely not a surprise to know that before I joined the paid leave team at Panorama, I worked in tech. It’s been interesting to learn just how influential the tech sector is on the national conversation around paid leave. Media coverage of tech companies coming out with new or expanded paid leave offerings is frequent, with the industry leading the so-called “parental leave arms race.” The tech sector has sizeable profit margins and steep competition for talent, so it follows that employers are finding innovative ways of differentiating themselves from their competitors (or matching their competitors’ offerings). What you don’t see in the news is how this race is having ripple effects far beyond the confines of tech. Through our work on The Paid Leave Project my team and I have had in-depth conversations with large employers on the topic of paid leave, and the influence of the tech industry has come up again and again. In addition to competition for tech talent, employers find themselves vying for non-tech talent when they’re in close vicinity to a tech company. Agnostic to sector, workers are heavily influenced by the media coverage on tech’s paid leave programs, and benefits overall. People across the country are talking about the industry’s generous policies in employee groups, millennial fathers are forwarding these announcements to human resources, and unions are using this information in their negotiations. Tech’s outsized influence is indisputable. As I look through the conference agenda, I see an abundance of speakers and thought leaders from the tech sector. Hosted by Globoforce (tech! ), WorkHuman is focused on the next generation of HR, working with businesses who thrive by bringing humanity to the employee experience. While paid leave is clearly in this vein, I was surprised to see that paid leave is not a topic of discussion here. We believe the tech sector still has an important role to play by sharing the results, outcomes, and impacts they have seen because of offering paid leave. When Google increased paid leave to 18 weeks, the rate of new mothers leaving dropped by 50%. SAP shared that paid leave drives an increase in employee engagement, and every one percent increase in employee engagement equals a $75 million increase in net operating profits. We’re excited to see other organizations here at WorkHuman that are leading the way with paid leave benefits, including Twitter, Intel, and LinkedIn. We hope they will also lead the way as the national conversation on paid leave evolves; by sharing information that will build the business case, they can affect more widespread adoption of this benefit and ultimately increase access for more U.S. workers. On Dec. 22, 2017 the President signed the GOP-backed Tax Cuts and Jobs Act into law. While it’s most known for the sweeping tax cuts it’s aptly named for, the bill also includes a number of provisions, including a tax credit related to paid leave. This makes it the first paid leave measure at a national level. Unlike other recently proposed paid leave bills this provision does not actually require employers to roll out paid leave to their workforce. Rather, starting this year, it will provide a tax credit to those employers that offer at least two weeks of leave and compensate their workers at a minimum of 50 percent of their regular earnings. To qualify for the credit employers must offer both full-time and part-time workers paid leave if they have been employed at the organization for at least a year. This overall effort can be viewed as a trial as it will end after 2019, unless extended by Congress. For more on this, join Ernst & Young LLP professionals for a Jan. 31, 2018 webcast on important developments in employment-related federal business tax credits and what to watch for in 2018. This is the most comprehensive article on paid leave we’ve seen in a long time. Starbucks just announced it is expanding paid leave to hourly workers. This follows the same recent news by Walmart. These are two huge employers of U.S. workers = huge impact in terms of increasing U.S. workers’ access to paid leave. Walmart employs 1.5 million in the U.S. alone. Chart/ visual shows paid leave at about 20 of the U.S. largest companies. Most important takeaway in this news: 1) We are increasing access for hourly workers, not just corporate employees. This is huge progress for equality. 2) Let’s acknowledge the role of the new tax credit at play here. It’s a sign that the effects of low unemployment have reached companies that rely on low-wage workers. Both companies credited tax cuts. 3) This is particularly significant because the retail industry is traditionally known to have low profit margins, making it more challenging to offer extra employee benefits and supports. 4) The tipping point. Industries benchmark against competitors. This news will have a domino effect. “A corporate person having a child versus someone lower having a child, there’s no difference — that child still needs its parents,” said Paris Mendez, who loads trucks at a Walmart distribution center in Smyrna, Del. Paid leave is becoming a gender neutral conversation… men are caregivers too! And paid leave helps keep women in the workforce which is good for business and good for the U.S. economy. Americans are not ambivalent about whether paid leave helps workers. In a recent Pew Research Center survey, 94 percent said it would help families, and two-thirds said it would help the economy. Business leaders and decision makers are asking us to “show them the ROI of paid leave.” Here it is: Research has found that mothers who take paid parental leave are more likely to be working a year later, and less likely to receive public aid. It also improves mothers’ physical and mental health; the duration of breast-feeding; babies’ health and development; and gender equity. When fathers take such leave, research shows, they are more involved in their children’s lives years later; their children are healthier; and mothers have increased earnings and better mental health.